How did I get it? Annoyingly, I can't remember. It was a competition win. My longest break without posting. One major reason - the European Championships and endless football matches. England are still in it, as are Wales, Northern Ireland and the Republic of Ireland - an incredible feat. There have just been 2 rest days without football but I still didn't post as I'm a bit sad and very scared over Brexit. 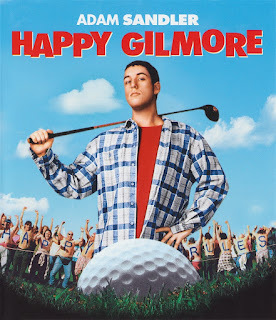 But this blog isn't a politics blog (although the ability to vote freely is a freebie and a victory that we all should use at every opportunity), so that's the last of saying why Happy Gilmore is happier than me. If you've seen Happy Gilmore then you'll know he's anything but. Adam Sandler plays the titular chap who isn't one of life's winners. Happy has anger issues that stem from the walk out of his mother and the death of his father when he was a kid. Only grandma (with whom he lives) seems to get Happy's unconditional love. All this is played out in the opening few minutes as a scene setter. Happy shares his father's love of hockey (ice hockey to us Brits; field hockey is what we know as simply 'hockey') but he really isn't very good. Every year he fails the trials but he still classes himself as a hockey player. Barely able to skate, lacking basic hockey skills and hampered by his temper, Happy does possess an incredibly hard shot. Using this in an unconventional way, Happy takes on the world of golf ... and this is definitely a golf film. The film is rated 12 and I watched with my eleven and a half year old son. It's not bad, but there is a fair bit of cussing in it that would have made it a 15 back in my day. The gorgeous Julie Bowen appears in stocking and sussies a couple of times too, but nothing worse than that really. As a comedy ... it's OK. It harkens back to an eighties Police Academy affair a few times but there are some amusing slapstick scenes and some surreal moments which tickle my fancy, plus a cameo appearance from Lee Trevino. It's a heavily sponsored film too - I bet a large portion of it's gross takings are from Subway. I'd give it 6, my son says 8.